Michael Kors began designing clothes at the age of 19 and studied fashion design at the Fashion Institute of Technology in New York City. In 1981, Kors launched the Michael Kors womenswear line at Bloomingdales, Bergdorf Goodman, Lord & Taylor, Neiman Marcus, and Saks Fifth Avenue. Building on his success, Kors was named the first ever women’s ready-to-wear designer and creative director for the French fashion house Celine in 1997. In his tenure at Celine, Kors turned the fashion house around with blockbuster accessories and a critically acclaimed ready-to-wear line. Kors left Celine in October 2003 to concentrate on his own brand. Kors launched his menswear line in 2002. In addition to the Michael Kors runway collection, the MICHAEL Michael Kors and KORS Michael Kors lines were launched in 2004. KORS is considered the mid-tier line, between the runway and MICHAEL collections. The MICHAEL line includes women’s handbags and shoes as well as women’s ready-to-wear apparel. The KORS line contains footwear and Jeans. 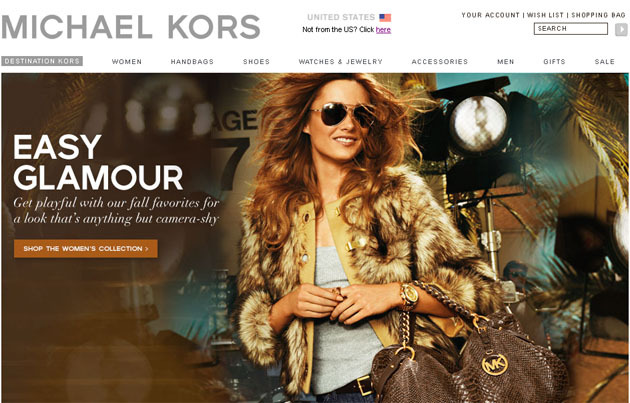 Currently, Kors has full collection boutiques in New York, Beverly Hills, Palm Beach, Manhasset, and Chicago. This year, Michael Kors celebrates 30 years in business. Among the celebrities who have worn Michael Kors’ designs are Jennifer Lopez, Rachel McAdams, Michelle Obama, Elissa, Heidi Klum, and Catherine Zeta-Jones. Joan Allen wore his gown when she was nominated for an Academy Award for Best Actress for her role in the The Contender. In addition, Jennifer Garner wore a custom creation as an Academy Award presenter in 2006. As Creative Director of Celine, Michael Kors designed many outfits for actresses to wear on screen. Gwyneth Paltrow wore Kors’ designs in the movie Possession. Cate Blanchett also wore his clothes in the movie Bandits. In addition, he outfitted Rene Russo‘s character in the 1999 hit remake of The Thomas Crown Affair. Elissa wore his dress in the World Music Awards 2005. The ad campaigns for Michael Kors often reflects the jet-set sportswear that Kors fans are fond of. Previous campaigns include the model Carmen Kass on the tarmac of an airport, on a safari in Africa, and relaxing on a yacht.